Recognise those lyrics from the Warren Zevon song, ‘Werewolves of London’? Well these days we have our very own Lee Ho Fook, Top 100 restaurant in Melbourne CBD, but you won’t find anything resembling a traditional chow mein on the menu. After stints at Marque and Mr Wong in Sydney, chef Victor Liong is running the kitchen and he’s serving up his own modern take on Chinese food. There’s certainly one thing that his food isn’t lacking, and that’s Flavour- yes, with a capital ‘F’. Big bold flavours and even a few chillis that will blow your head off (luckily they warn you about those ones). It’s a nice modern and simple interior with wooden tables and chairs, and I really love the gorgeous blue and white plates and bowls, not to mention the bright orange chopsticks. The menu is pleasantly concise, with a couple of specials and a 10 course banquet option for $68 per person (4 people minimum). We started with an individual serve of Warm scallop with tofu and soy butter each ($7). 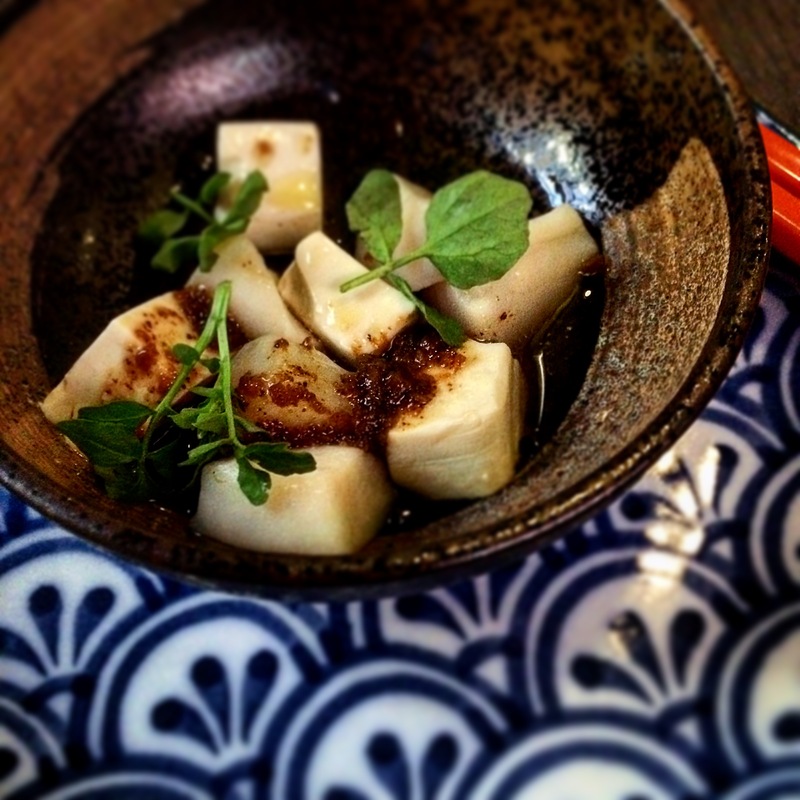 A nice light start – the slight chew of the scallop combined with the silkiness of the tofu. And then something completely different – one of the specials for the day – Chongqing-style chicken crackling, a beautiful plate of fried chicken skin! Who could say no to that?! Absolutely loved it – it had great saltiness and was crispy crisp ($8). We followed this with the super-spicy Wagyu beef tartare, puffed rice, cucumber and sichuan flavours – to be wrapped and eaten in squares of nori ($18). Victor certainly holds nothing back with this dish – the flavours really hit you in the face – in a good way! On the larger dishes we couldn’t help but order the Aylesbury duck, red wine miso glaze, green sichuan peppercorn and nashi pickle ($30). The duck breast was so succulent, and that glorious glaze was smeared across the plate. We accompanied this with some Stir-fried white cabbage with dried chilli, sichuan pepper and crispy kale ($16) – it sounds simple but this dish was a winner, especially with the Lee Ho Fook fried rice ($10) which, although more subtle in taste than most fried rice I’ve eaten it was seriously the most fluffy fried rice I’ve ever experienced – every grain perfectly separated. I’d like to know how they do that! And finally to finish off, the Jasmine tea infused custard burnt caramel ($5). A good, not-too-sweet dessert, and tastes exactly as the name suggests. It’s fun food to be had with friends, and with reasonable pricing, you’re not going to choke when the bill finally arrives. For Chinese food with a difference, Lee Ho Fook is definitely worth a try. http://www.bbc.co.uk/radio2/shows/vine/openinglines.shtml – and the song was voted as having the best opening line ever…. I’m sure others would agree to disagree. Ha! Very good Mr Brown!